Bryan Hible - born in Sheffield, England in 1965, and now living and working in Nottingham - has been painting in acrylics for around thirty years and produces work in a realist style. He has a very eclectic range of subject interests, with modern still-life and portraiture perhaps dominating. 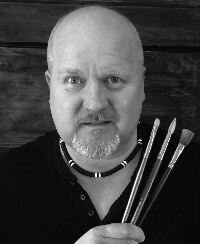 After many years of 'hobby' painting, considered by Bryan to be his art education, he began painting full-time in 2009 and quickly established a professional reputation, having work accepted into numerous exhibitions around the UK and securing representation with various independent UK galleries. His paintings have sold around the world and are now being sought after by collectors, with work in public and private collections. After shortlisting in 2011, Bryan won the 2013 Richard Attenborough Award, given by Leicester Museums for his painting “Happy Hoodie Spots A Ship”. The piece was also purchased by the museum for their public collection. Bryan accepts commission work, as time allows, and is currently working on various personal projects, predominantly the series 'Life's a Game', which depicts ultra close-up views of board games in progress. Due to the scale involved and the utilisation of dramatic lighting, which focusses attention on a small area, the viewer is transported into the game and is invited to see aspects of human life being played out on the game board.